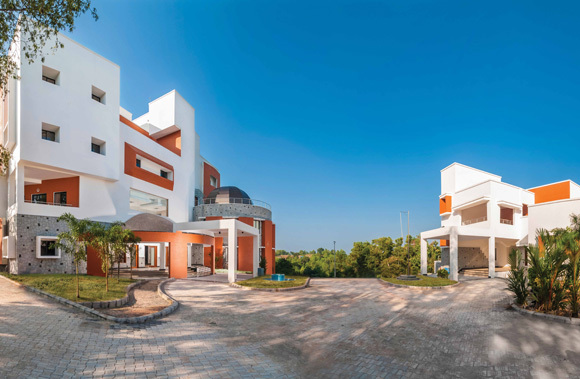 HLL’s Corporate R&D centre is a state of the art facility located in idyllic surroundings at the akkulam lakeshore in Thiruvananthapuram in Kerala, India. It is spread over an area of 2.5 acres with a built-in-area of 60,000 sq.ft consisting of the academic block and laboratory block. CRDC aims to be centre of excellence boasting international standards and providing a platform for both fundamental and applied research. Through the interchange of creative, imaginative people, a global Research and Development (R&D) centre that encourages collaboration and cooperation among highly reputed research centres in the country; and a strong commitment to ongoing investment, we have put R&D at the centre of everything we do. From Blood Transfusion Bags to Hydrocephalus Shunts, once-a-week Non Steroidal Oral Contraceptive Pills and several variants of condoms, every product from HLL is a result of innovation. The last four decades have seen HLL network with various scientific and academic institutions of excellence for developing novel healthcare products. HLL has a state-of-the-art R&D centre at Thiruvananthapuram in Kerala, India. HLL's corporate R&D centre (HLL CRDC) has several projects in hand, carried out in-house or on collaborative mode, with premier academic and research institutions in the country and abroad. These projects cover a wide area of research ranging from development of novel techniques for drug delivery to blood filters, novel contraceptives and cancer-care devices. Some of the institutions HLL has networked with are-Indian Institute of Technology (IIT), Kanpur; Central Drug Research Institute (CDRI), Lucknow; Sree Chitra Thirunal Institute of Medical Sciences & Technology (SCTIMST), Thiruvananthapuram; Regional Cancer Centre (RCC), Thiruvananthapuram, and Population Council, USA. Based on its technological competency, the R&D centre is implementing sponsored projects from organisations including Department of Science and Technology (DST), Defense Research Development Organization (DRDO), Kerala State Council for Science, Technology & Environment (KSCSTE), Department of Biotechnology (DBT), and international agencies like Bill& Melinda Gates Foundation. HLL CRDC has also undertaken contract research in the area of drug releasing implants with organizations like HRA Pharma, France and Population council, USA.